the volunteers, participants, and crews, and having the event come off without a glitch. and adaptable and all performed in an outstanding fashion!" Although this paragraph described what happened in another "snow year" (2008), it is totally appropriate for this year, too -- when race management had to make even more drastic course changes because of record-breaking snow in the Bighorn Mountains. Jim and I aren't privy to everything that is going on behind the scenes but we've learned a lot over our years of being involved as volunteers with this race and friends of the race directors re: the types of decisions that have to be made in very little time when Mother Nature plays havoc with the calendar. Because of the timing of this race in late spring, the snow often melts just before the event is run. 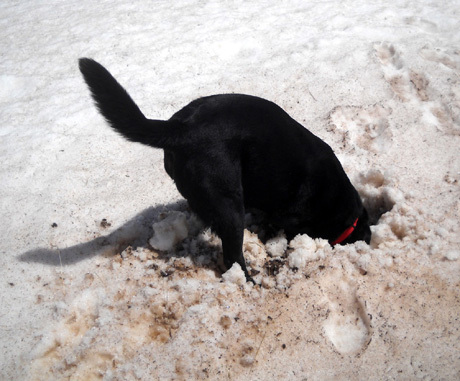 That causes some concerns in the weeks leading up to the race but usually so much snow melts in the days before the race that the normal courses can be run. They're usually sloppy at the higher elevations, but navigable. 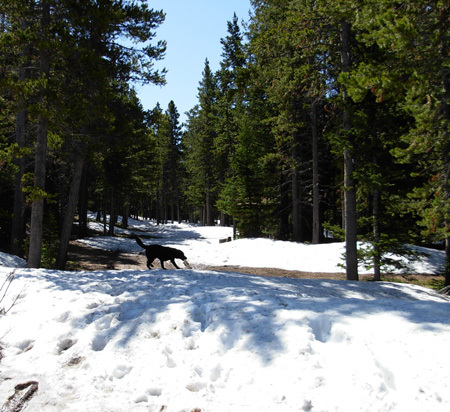 Yesterday, at 9,100 feet in the Bighorns! This year the problem was the huge amount of snow that fell during the winter throughout the Rockies and nearby mountain ranges like the Bighorns, Sierras, and Cascades. 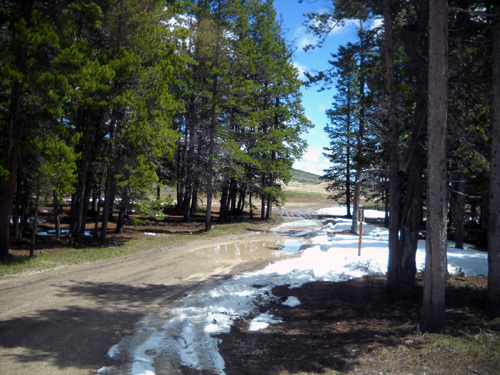 It simply hasn't melted yet at elevations above 8,000 feet in the Bighorns. 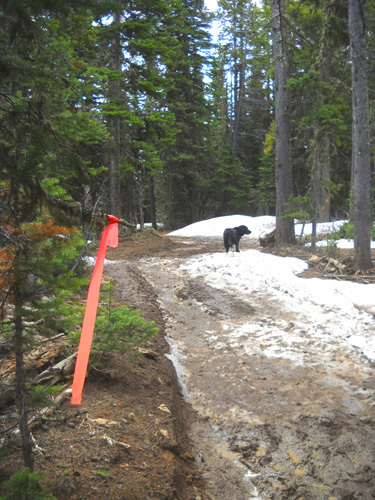 That seriously impacts the Bighorn 50K, 50-mile, and 100-mile race courses. 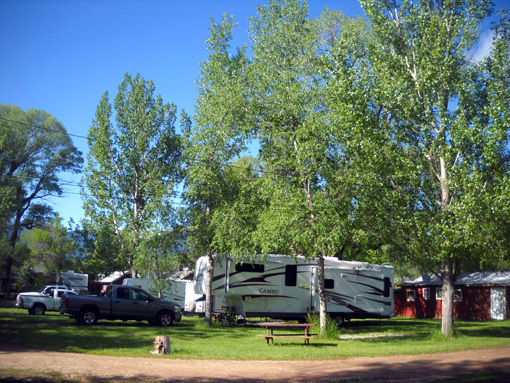 Since spring is about three weeks "late" in the Bighorns this time major changes are being made again to ensure the participants have a quality event. There is too much snow to even use the 2008 snow reroutes; Riley Point above Cow Camp is totally inaccessible this time. That loop, traditionally used in the 50K, was also part of the 50- and 100-mile course three years ago when the higher elevation aid stations were inaccessible. Seems like it'd be easier to change the date to later in the summer so weather isn't such a big factor, but that's not likely -- not because this is the 20th year for the event (10th for the 100-miler) and the date is cast in stone, but more because of Forest Service restrictions. One factor is when cattle are let loose in the high country. 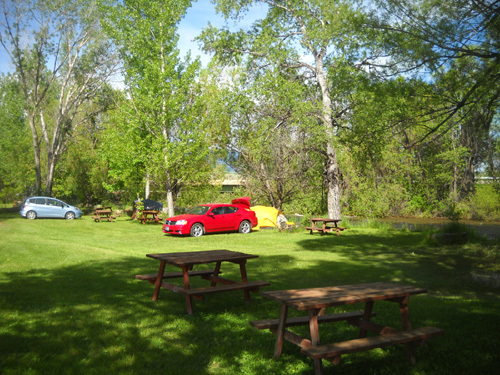 There's also the matter of coordinating this race with other events in the Sheridan area. close to race day. I took this photo near the Porcupine Ranger Station four years ago. It also seems to me like it'd be easier to cancel the race this year but Jim and I are glad that wasn't an option to these folks. In talking to Karen and other race staff I never got the idea that anyone ever seriously considered canceling the event this year. That would have been devastating to the community and to many of the participants; most would rather run a different course in the Bighorns than not run any course at all this weekend. Some critters have more fun in the snow than others! Cody either hears or smells something. Canceling a large, popular race like The Bighorn would have presented a whole new set of problems. It was probably easier to figure out the reroutes, clear and mark them, determine where the aid stations would be and who would man them, pack supplies into the aid stations via foot or ATVs that volunteers can't access with larger vehicles, and deal with questions and complaints from 900+ runners -- all while working within budgetary and Forest Service constraints, of course! These folks aren't getting much sleep this week, I can assure you. They've been working their butts off to maintain the high quality event for which they are known. They've even added some new "bells and whistles" I'll mention later. The exact courses for all four race distances, and exactly where each will start, have been a work in progress this week. The rate of snowmelt and the condition of the Forest Service roads to Dry Fork have been a major factor in deciding where it's feasible to send the runners this time and make sure they have the on-course support (i.e., aid stations) they need in the wilderness. The 100-mile course was determined a few days ago. Runners will start one hour earlier on Friday morning (10 AM, not 11) and they will begin in Dayton, not four miles up the Tongue River Road as they usually do. Instead of running out-and-back to the Porcupine Aid Station via Dry Fork, Cow Camp, Foot Bridge, Spring Marsh, and Elk Camp, they will be rerouted through the new Twin Buttes AS both out and back to/from Spring Marsh at just under 7,000 feet. They will miss the upper 16 miles of the course (8 out, 8 back) that go up to 8,800 feet at the Porcupine Ranger Station. To my knowledge their high point, and the high point in the rerouted 50-miler and 50K, will be 8,100 feet on Camp Creek Ridge. Ditto for the 30K, which probably won't be rerouted at all. (Cody and I took a hike on the route after the race began). It appears that the 30K, 50K, and 50-mile races will all start at Dry Fork. Karen and Wendell decided the road has improved enough in the last two days for volunteers and crews to get out there. Hopefully none of the buses will get mired in snow or mud on the nine or ten miles of forest service roads leading to that location! 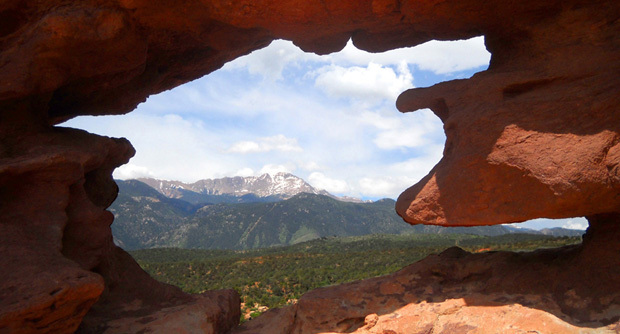 A lot can happen in two or three days in these mountains -- both good and bad. It's been warm enough the last couple days to melt some of the snow. That's good. However, we're supposed to get a couple of inches of rain tonight. We can't help but wonder what it's going to do in the mountains tonight! Another two inches of snow is expected at the higher elevations. That is not so good. In addition to assessing changing conditions on the course and making decisions where to route it for each race distance, Karen Powers, Wendell Robison, Rich Garrison, and other trail crew members have been busier than usual clearing the trails and jeep roads by sawing fallen trees, moving a car-sized boulder near Foot Bridge, clearing landslides, and marking the courses so no one gets lost. A lot of work has been done behind the scenes to make the race possible this year. I hope all the participants will appreciate that and not complain about anything that is "different." 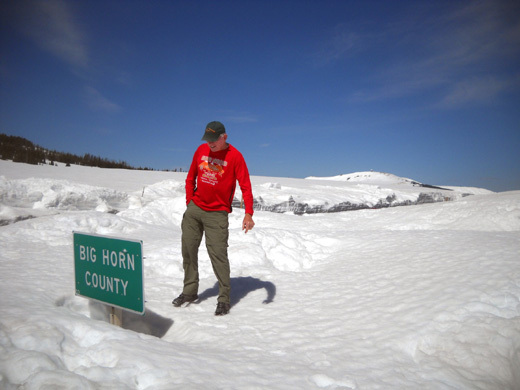 Some other events in the West have been canceled this year because of the high snowpack. We should be very grateful that this one will be conducted. There are about 950 runners registered for the four race distances, more than last year. As usual, the shorter the event, the more runners there are. The shortest distance, the 30K, filled up first and fast when registration opened in January. Runners could still enter the 100-mile race until more recently. 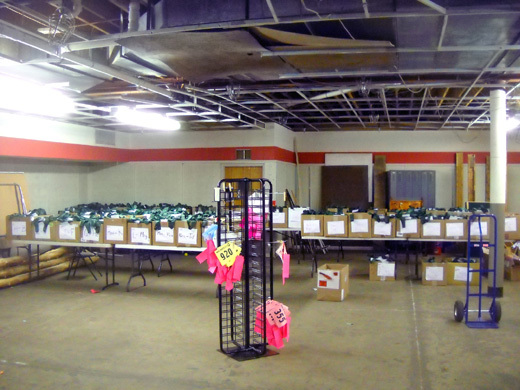 Race staff, volunteers, and Karen's sporting goods and shoe store employees began collating and stuffing items in the runner bags on Monday before we arrived in the area. They were able to fill the 50- and 100-mile bags that day. On Tuesday morning they finished all the 50K bags. That left only the 30K bags to do on Tuesday afternoon. Did I say only? Well over 300 runners are registered for that race. Jim and I enjoy packet stuffing but we've learned from the huge Leadville bike and foot races that it isn't much fun to be on an assembly line with 950 bags coming your way! It's too much of a strain on us as we get older. We told Karen we'd be glad to help on Tuesday afternoon, but couldn't handle the job all day. She graciously assured us that she had enough folks for the morning shift and actually preferred that we come in the afternoon. This is just part of the runner bags that are ready to be distributed. 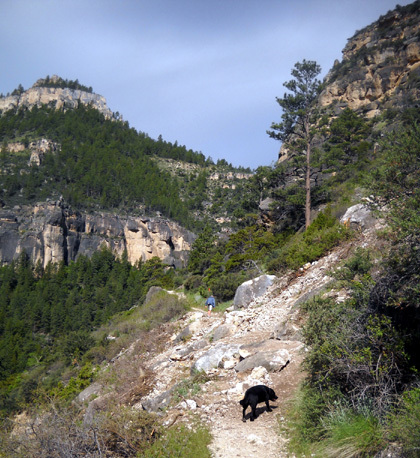 We hiked in the Tongue River Canyon that morning, then drove down to Sheridan. We arrived at 12:30, hung around the shoe store talking with folks during lunch, and worked on the 30K bags from 1-4 PM. Even though we don't know most of the 30K runners it was interesting to fill those bags because of our vested interest -- we are both now registered for the 30K. 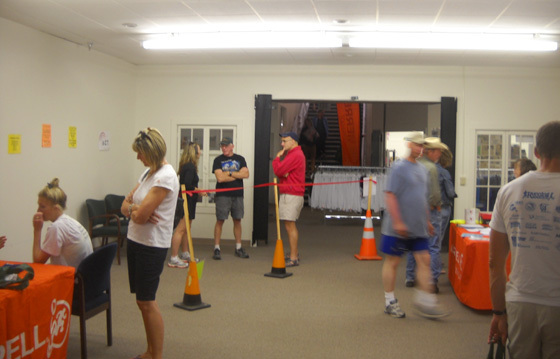 Each year the bag-stuffing and packet pick-up process and/or location at Bighorn is a little different. The stuffing process definitely went more smoothly this year than previously -- and with fewer people. We had lots of room to stuff and store the bags so they were easy to find when runners came to pick them up. The bag pick-up process needs some refining, however. Jim and another volunteer tweaked the process but it still needs some work to reduce inefficiency for the volunteers. More about that in a minute. 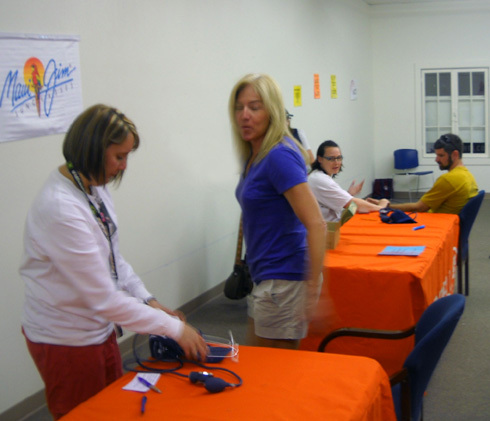 The 100-mile race begins tomorrow (Friday) morning; those runners picked up their packets today. white in the background, Cheryl in the yellow top, and Wendell on the right in red. We also accommodated partners who were in one of the shorter races -- they could pick up their bags also, instead of waiting until Friday. Part of my job was being the person who retrieved those bags. Our friends Matt and Anne, and Jim and I, helped initiate that procedure several years ago. It was hard for Anne and me to crew for our fellas in the 100-miler on Friday AND go all the way down to Sheridan to get our own race packets within the designated time frame of 2-6 PM. Cheryl and Michelle saw the light and let us get our 50K or 50-mile bags when Matt and Jim picked up their 100-mile bags. Other runners caught on, and now it's more standard practice -- but only if the runner in a shorter race comes in with a 100-miler (significant other or crew). Jim and I worked steadily from noon to 6 PM today. We were on our feet most of the time and it became very tiring. The system for picking up the 100-mile bags was great for the runners but it wasn't very efficient for us as bag retrievers. The packets were in the large warehouse-style room where we stuffed them. Since it was so large, we assumed the runners would go in there to pick them up. They weren't -- they were well down the hall in a smaller room where they did their medical checks, had their race bibs with embedded timing chips scanned (a great new feature this year), looked at maps with this week's course changes, asked questions, bought extra meal tickets, etc. 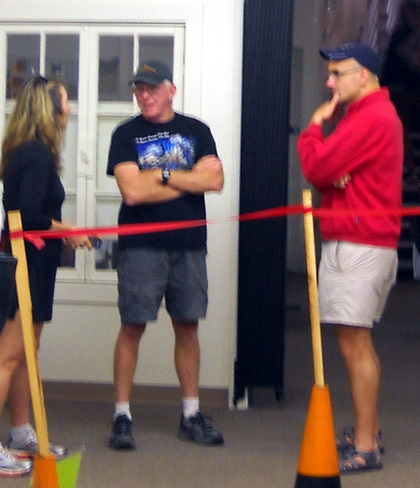 Jim (center) and John (R) talk with a runner as she waits for her pre-race medical check. The initial procedure was for Jim, a volunteer named John, and me to identify the incoming 100-milers, ask their names, tell them to wait in line for their medical check, and then walk down the hall and into the large room to the back where the boxes of bags were located. We pulled the correct bags and took them back to each runner, trying to remember who was who if we didn't already know them. As usual, we know more people in the 100-miler than in the shorter races. It was a LOT of walking back and forth for us most of the afternoon. I got reassigned to help Cheryl at the "trouble desk" after half an hour but that job still required me to run back and forth to the "bag room" innumerable times. I retrieved bags for runners in the shorter races, scanned timing chips (that was the most fun), made changes to bags of runners who changed distances up or down (mostly down), put notes on bags of runners who needed to pay more money or supply more information, and re-ordered dozens of bags that were out of numerical order. I had only a little bit of time to talk to friends as they checked in. Wendell Robison (L) completes the medical checks of one of the runners. Jim finally made a change to the system on his own to make it easier on him and John the last two hours when the majority of the 100-milers came in. He moved a couple tables and all of the 100-mile boxes of bags over to the doorway of the large room, then pulled the correct bags and handed them to John when he came over to get them for the runners. John still had to walk back and forth between the rooms but only half the distance he did before the change was made. Nor did he have to hunt for the bags. 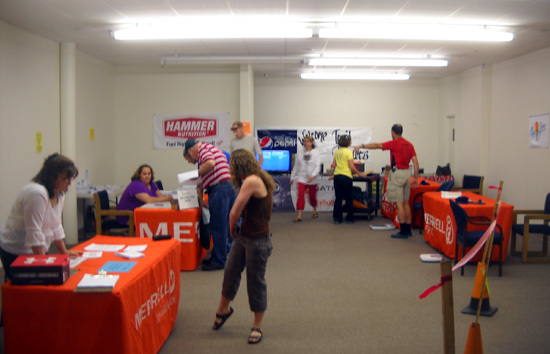 We think it would have made more sense for the runners to go to the "bag room" first to get their bags or to do everything in the one large room. To complicate matters none of the volunteers were issued volunteer shirts today so the runners had no clue who was volunteering and who was just standing around, and the signage wasn't as good as it could be. I don't know if the procedure will be different tomorrow when up to 800 more runners come in for their 50-mile, 50K, and 30K bags; we won't be there to assist with that. It's too tiring the day before our race to be standing on our feet on concrete floors for several hours. It sounds like tomorrow will be a madhouse with so many runners coming in. We both got our bags today so we can be out on the course watching the 100-milers at Dry Fork and Twin Buttes tomorrow. 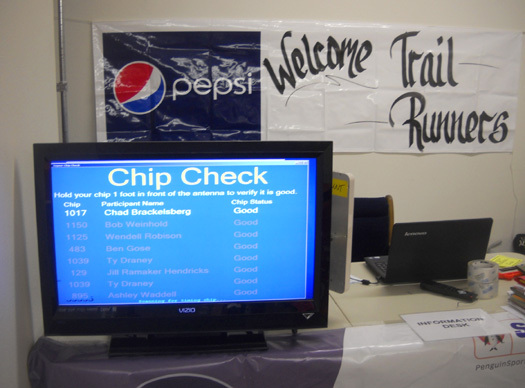 The 100-mile runners shouldn't have noticed any problems today with check-in procedures. They had a lot more room than in previous years and the flow in the small room was good. Foreground: Melanie (L) does Susan Gardner's medical check. Then the runners got their timing chip scanned to be sure it worked, the number was correct, and their name was spelled correctly. Scanning the chips, advising runners not to fold their number, and telling them about the advantages of the chips was my favorite job today. It was fun to introduce something new to the race. Chips embedded on race bibs are more common in road races than trail races so many of the Bighorn runners weren't familiar with them. All of the runners have these disposable chips attached to the back of their race bibs. The chips will be scanned at one or more aid stations and at the finish. That should really help with results, considering how large this event has grown. If they work, they will be well worth the extra 95� each chip costs. Other benefits of the chip timing are real-time results on the web during the race, and for $2 crews can receive text messages during the race to see where their runners are. After getting their chips scanned the runners were directed to the new course and topo maps. Wendell and/or Michelle were available to answer the innumerable questions generated by all the changes this year. Runners could also check the weather report, pick up pacer waivers and bibs, buy meal and bus tickets, look at the finishers' awards, etc. 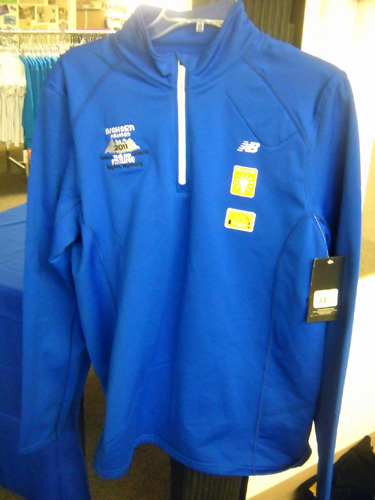 The finishers' jackets for the 50K are the same style and fabric but in different colors (men's = red, not sure of the women's color). 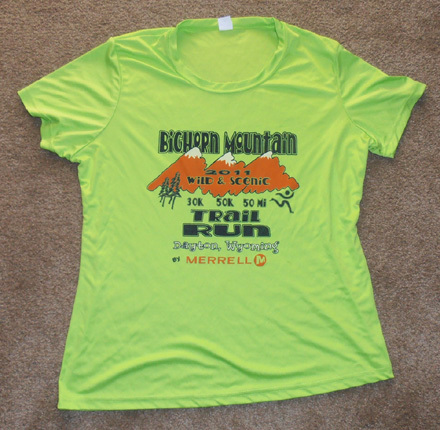 One of the things I like about this race is that the garments are always gender-specific. The women's cuts generally fit me better so I order them. Women who prefer to receive men's garments can indicate that when they enter. 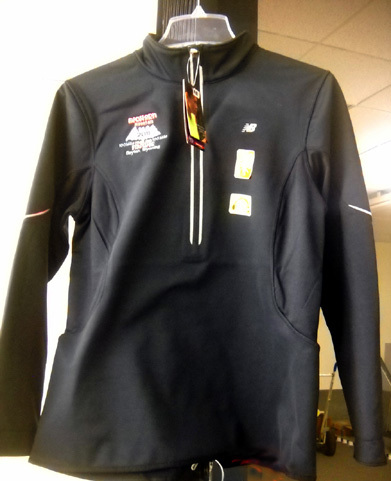 The finishers' garments for the 30K are soft black fleece full-zip vests with hand-warming pockets and an embroidered logo. 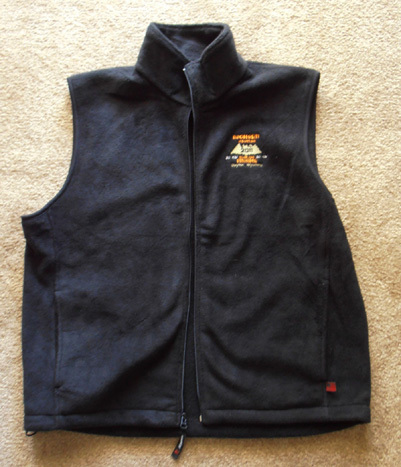 The men's vest is shown below; the women's version is cut a little differently and has a pretty purple logo. That's what Jim and I will receive at the end of our race. They are very nice! 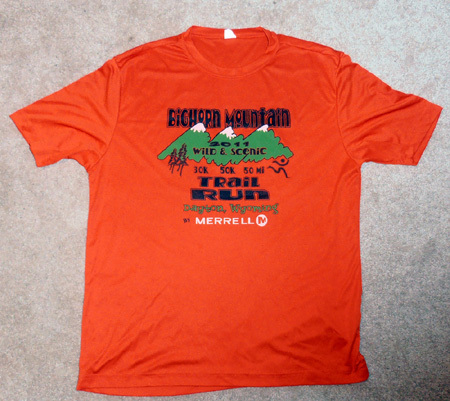 The jackets, vests, and shirts we've received at the Bighorn race over the many years we've run the event are some of our favorites. Those will make nice hiking/biking shirts, too. The best part of working packet pick-up is seeing friends we haven't seen in a while -- folks like Matt and Anne Watts from Colorado, Dennis Aslett from Idaho (Jody was participating in another event somewhere), Susan Gardner from New Mexico, Davy Crockett from Utah, Diane Gorsky and Bob Thurston from Wyoming, Russell Gill and Francesca Conte from Virginia, Mike James, Les Mignery, and Franklin Coles from Montana, John Hobbs, Allan Holtz, Miles Krier, and others. Just wish we'd had more time to socialize with some of them. Susan is camped next to us so we've already visited a while, and we got to spend some quality time this evening with Matt and Anne. We'll see even more of those two during the next three days. One of the perks of helping out today was getting our dinner free at Ole's. Hundred-mile entrants received free tickets for the dinner buffet; families/crews had to pay to eat there. We wanted to leave check-in at 5:45 PM so we could have dinner with Matt and Anne but we were so busy with runners the last two hours that our help was really needed until 6. Many waited until late afternoon so they could pick up their packets and then go right to dinner. Bless Matt and Anne, who waited until we were done with our jobs to go to dinner. We had a great time catching up with their latest news. Although we e-mail regularly we especially value the "face time" we have at races. The Bighorn pre-race dinner at Ole's is a pizza-pasta bar with veggies, salads, and drinks. The restaurant was fairly full of runners but we didn't have to wait for a seat. Since we weren't preventing anyone else from getting a seat, we hung around talking for about an hour. 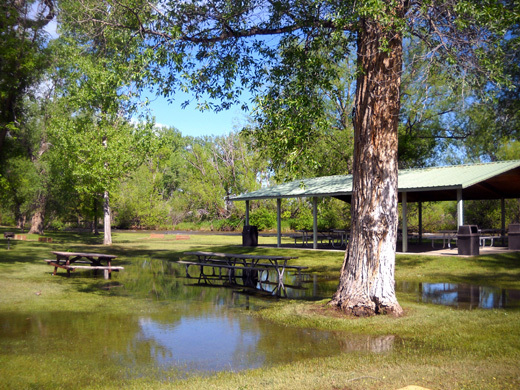 I took some pictures of the campground this morning while it was still fairly calm. I thought more of the 100-milers would arrive yesterday (Wednesday) but the cabins and campsites were still mostly unoccupied this morning. Most of the 100-milers waited until this afternoon to come in. in the foreground. Another RV came in during the day and parked on this side of us. This morning there were only two folks in the large tent area. By evening it was fairly full. What a good boy! He sure was hungry, though; he normally gets his second meal at 2 or 3 PM. As usual he was more interested in eating first than going outside to "potty." He has his priorities. I took him for a walk through the campground and Scott Park before bedtime, noting that the water level in the Tongue River was still high -- the highest I've seen all week. Now there are signs in the park advising visitors to stay out of the area they've roped off near the river. The race finish line and tents will be moved farther "inland" this weekend. The usual finish area was waterlogged this morning. Good thing, because -- as mentioned earlier -- another two inches of rain are predicted in the area tonight, with snow in the higher elevations in the Bighorns! Race management and participants have their fingers crossed that it doesn't snow any more below 8,100 feet . . .